A new documentary from the CBC’s Doczone series, titled Windrush, takes a look at the widespread resistance to wind power in Ontario, which is largely based on noise and health impacts. While the CBC video is only viewable in Canada, a regional organization opposing industrial wind has posted a version on YouTube (it’s 42 minutes long and ends a bit abruptly; it’s unclear whether it’s abbreviated, or simply missing the end credits). This is a fairly balanced program, especially in highlighting the differences between building wind farms in the wide-open spaces of Alberta and the more densely populated rural areas of Ontario. While it gives a lot of screen time to researchers and public officials who are studying the negative responses of many neighbors to nearby turbines, it’s useful and important to hear these sober and measured voices of concern. The conventional wisdom, as reflected in the MOE health effects report, is also presented, though more as a context within which the program attempts to explore the persistent claims that living near turbines can be more difficult than these reassuring assessments suggest. Perhaps the most powerful element of the program is the aerial photography of wind farm areas, which give a compelling sense of the scale of the turbines as compared to the homes, as well as the vast landscape impacts, leaving many homes surrounded by turbines. The segments filmed in Denmark are valuable as well; these reflect the growth of turbines from the 660kW machines common there, to the newer 3MW giants that are causing far more pushback, in both Canada and Denmark. It also feels very valuable to hear and see some of the people who’ve been so widely cited about their concerns, including Lynn, Michael Nissenbaum, otologist Alec Salt, and acoustician Henrik Moller. Too often, the basic human empathy and spirit of inquiry that fuels their work is obscured by the crassly dismissive near-vilification of these researchers by supporters of the industry (and also, to a lesser degree, by the hyperbole of some industrial wind opponents). And, throughout the program, retired nurse Norma Schmidt, who eventually moved out of her house, is a calm and compelling voice for the experiences of neighbors who have been affected. I heartily encourage anyone involved with wind farm issues to watch the film. For more, see the CBC Doczone’s Windrush web page, which includes a Director’s Statement, graphics, and several related stories. And, here’s an article from The Observer about the film. The Wisconsin Public Service Commission rejected the only large wind project currently in development in the state, citing noise concerns for homeowners in the vicinity. The Highland Wind project sound models suggested that turbine sound would not meet the 45dB night time noise standard at about 20 homes. Some of the acousticians who submitted testimony in the Highland hearings suggested that limits of 40dB or less would be more appropriate; doubtless many more homes would be living with sound between that level and the current 45dB standard. The recent collaborative sound study in Brown County was funded by the PSC in order to help understand the experience there before deciding on Highland’s application. The developer of Highland, Emerging Energies, is likely to resubmit the application with adjustments to the turbine layout to keep all homes under 45dB. UPDATE, 5/3/13: The PSC has agreed to consider a revised plan from Emerging Energies, which may include night-time curtailments of turbines near the closest homes—apparently not routinely, but just when atmospheric conditions especially enhance sound propagation. Meanwhile, in the town of Heath, Massachusetts, the Planning Board and Renewable Energy Committee (REAC) has recommended that citizens approve a ban on industrial wind at the Town Meeting later this month. Again, noise was a primary factor, thanks to the very quiet level of ambient sound in the deeply rural area; the REAC recommended a 2-mile buffer to maintain current ambient sound levels and preclude against any possible property value losses. New NMFS Navy “take” permits: outrageous or reasonable? 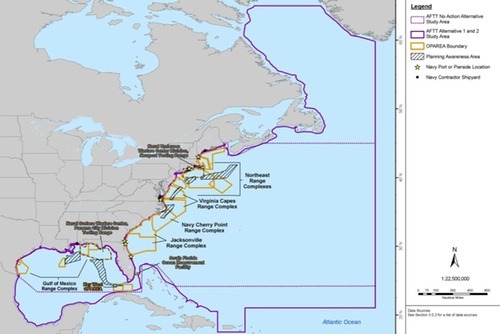 The release of Proposed Rules to govern US Navy training and testing operations in the waters of the Atlantic, Gulf of Mexico, Southern California, and Hawaii from 2014-2019 has put the National Marine Fisheries Service (NMFS) in the crosshairs of an outraged response from environmental groups. NRDC, the Center for Biological Diversity, and others point to the staggering numbers of “Level B” harassment that will be allowed: over 31 million incidents, along with “Level A” injury predictions including permanent hearing loss numbering in the thousands, capped by several hundred deaths. These numbers reflect far more than sonar training; also included in these permits are impacts from ongoing training and testing of systems used in live gunnery and torpedo exercises, explosive mine-neutralization, air, surface, and submarine battle exercises, and ship-shock trials (in which large explosives are set off near ships to test their resilience). “We’re talking about a staggering and unprecedented amount of harm to more than 40 species of marine mammals that should give any federal agency involved, be it the Navy or the National Marine Fisheries Service, pause,” NRDC attorney Zak Smith said in a statement. The take numbers are generally about twice as high as those in the last round of permitting, which covered a five year period from 2009-2013. How could NMFS sign off on such a seemingly devastating number of permitting takes? Well, as is often the case, the picture isn’t quite as clear as the headlines may make it seem. Indeed, we are once again thrust into a funhouse-mirror world of wildly divergent ways of framing the proposed plans. Press releases and resultant popular press headlines trumpet the NMFS rule as “allowing the Navy to harm whales, dolphins more than 31 million times,” with the permitted incidental takes being described as including “a wide range of harms, including destruction of habitat, physical injury and death.” The Navy’s statement offers a much more sanguine perspective on the tens of millions of behavioral takes, describing these effects as “e.g., turning head, changing swim direction.” Huh? What to make of all this? After a few hours of reading and digesting several hundred pages of environmental analysis and permitting documents, I was able to distill a few of the key take-aways that may help readers to understand NMFS’s reasoning, as well as the shortcomings of the plans. Click through for my ten-minute version of what’s in these permits. Deepwater Wind, developers of a proposed 5-turbine wind farm off Block Island, Rhode Island, has agreed to refrain from pile driving for one month a year in order to minimize impacts on critically endangered North Atlantic right whales. Pile driving, a key part of building the foundations for shallow-water offshore wind turbines, is the loudest aspect of offshore wind construction and operation. Deepwater Wind, in consultation with the Conservation Law Foundation (which is deeply involved in right whale protection), agreed to suspend pile driving in April, the time of year when right whales are most commonly present in nearby waters.